Home, office, coffee shop; you are connected! What primary service does JCC Hosting provide? JCC Hosting manages your corporate data and applications on your own private server in our data center. We manage the backup procedures, system updates, licensing, anti-virus updates and configure remote access from your desktop or laptop to your data from anywhere in the world. 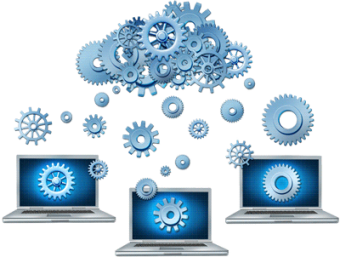 This type of service is known as "cloud computing" or a "hosted server" solution. What makes cloud computing possible? This technology is possible because of the availability of high-speed, low-cost internet connections. Almost everywhere you go, you have access to a high speed internet connection. Additionally, the continued evolution of mobile devices and applications is making cloud-based solutions the standard for businesses of all types and sizes. Yes! Not only does a cloud-based solution provide smaller businesses access to the same technology used by large corporations, it is cheaper than owning and managing your own server in your own office. A cloud-based solution offers a business better, more reliable systems for less money. What makes JCC Hosting the preferred provider for cloud-based services in Central Ohio? The answer is service. A contract with JCC Hosting includes all the required on-site service to help you migrate your data and applications to your JCC hosted server. Additionally, we will help your organization establish a Microsoft Windows domain for security, install and configure remote VPN software on your laptops, monitor your network availability and connection to your server, design and implement your backup strategy and be your IT partner as long as you have a contract with JCC Hosting. JCC Hosting also offers Linux and OpenVMS servers. Is a cloud-based or hosted solution right for my business? Currently, many business leaders are unsure if this type of technology makes sense for their organization. In fact, they aren't quite sure what exactly a cloud solution is and how it could benefit them. To be honest, the details of this technology are not important to a company president. What is important is cost and availability. It is that simple. If you find yourself facing the following questions, consider contacting JCC Hosting to see if a cloud-based hosting solution is right for your business. Would my business suffer if my computer systems were unavailable for an extended time? Is it important to have on-site IT support available when I need it? Why do I spend time managing our computer systems rather than focusing on my business? Do I have older server hardware that is ready to be upgraded? Do I trust my backup procedures? Have I successfully tested a restore procedure from my backups? How long would it take to recover my corporate data in the event of a catastrophic failure? Would my business benefit from the ability to access data and applications from home or vacation? Do I need to implement internal security because my company is growing? How can I use technology to be more efficient? How can I grow my business without growing the number of people it takes to manage my business? Am I facing a major upgrade expense for both computer hardware and computer software? Can I take advantage of mobile technologies to improve my bottom line? If you find yourself asking some of these questions, contact JCC Hosting for a free consultation. We have been in business for 29 years and have helped many of the world's largest and most successful organizations evaluate their technology requirements and improve their computing environment.